Dialysis chain NephroPlus Health Services Pvt. Ltd said on Wednesday it has raised Rs 100 crore (nearly $15 million) from private equity firm SeaLink Capital Partners and existing investor International Finance Corporation in a Series C round of fundraise. The company will use the funds to expand its network, it said in a statement. The dialysis chain said it has 75 centres across 15 states in India and plans to expand its network to 500 centres over the next five years. VCCircle had first reported SeaLink Capital’s plan to invest in NephroPlus on July 27. This is the PE firm's debut investment and its managing director, Heramb Hajarnavis, will join the NephroPlus board. Hajarnavis, who founded SeaLink in 2015, was earlier the head of private equity practice of KKR in India. NephroPlus had raised $4.25 million in a Series A round from Bessemer Venture Partners in 2011, followed by $10 million from IFC—the World Bank’s private-sector arm—in June 2014. O3 Capital and AZB Partners were the advisers for the latest transaction. NephroPlus was founded by Vikram Vuppala, Sandeep Gudibanda and Kamal Shah in 2009. Vupulla, who is also managing director, told VCCircle in January the company was in talks for acquisitions to expand its network. The company's net sales more than doubled to Rs 30.9 crore in 2014-15 from Rs 13.8 crore the previous year. Its net loss widened to Rs 6.8 crore but at a slower pace compared with the previous year. The firm is yet to file its financials for 2015-16. Other Indian dialysis chains that have raised funding or have attracted strategic buyers include DaVita NephroLife, Deep Chand Dialysis Centre and Sparsh Nephrocare. Deep Chand Dialysis raised around $5 million from Pragati India Fund in 2014 and is in talks to raise another round of capital, as reported by VCCircle last month. US-based DaVita acquired Bangalore-based NephroLife in 2012 and Sparsh Nephrocare raised Rs 25 crore from Tata Capital Healthcare fund in March 2014. All these firms are looking to tap into the huge market opportunity for dialysis services. It is estimated that over a million people in the country need to undergo dialysis sessions three times each week. But around 90% of these patients either do not have access to facilities or lack the resources to avail these services. The central government, in the Union budget earlier this year, announced a National Dialysis Services Programme to ensure dialysis centres in every district. 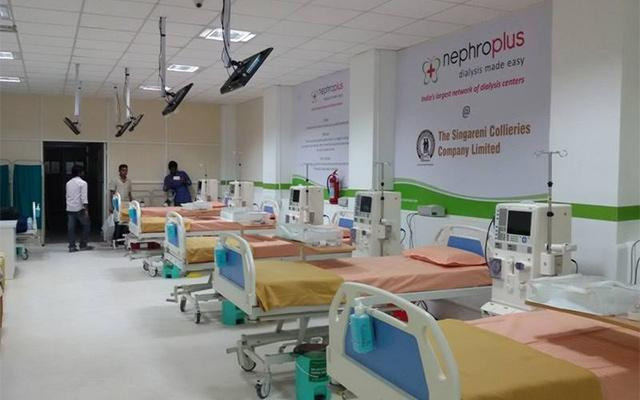 NephroPlus said it has recently signed a contract with the Andhra Pradesh government to run 13 dialysis centers in the state as part of this programme.